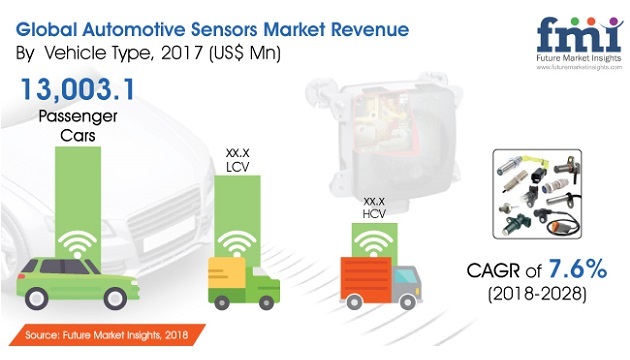 With the growing focus of automakers on integration of automotive with advanced sensors, the demand for automotive sensors will continue to increase. Decrease in prices, growing requirements worldwide, expanding product portfolio of automakers, and long term supply relations with key automotive manufacturers who are catering to all the principal types of vehicles are observed to be the key factors fueling increased revenue shares of leading industry players. According to the report, the global automotive sensors market is expected to witness a CAGR of 7.6% from 2018 to 2028. The market was over US$ 17 Bn in 2017 and is projected to touch a valuation of US$ 39 Bn by the end of 2028. Aggressive marketing in prominent countries in Latin America and the Middle East & Africa region is expected to further benefit major players in the market. A well-structured and efficient supply chain along with an amended retailing network for aftermarket automotive sensors is also a core growth strategy for reaching out to customers. The players are incessantly striving to maintain their position in the global automotive sensors market. Some of the companies operating in the market are Continental AG, Robert Bosch GmbH, Denso Corporation, Delphi Technologies PLC, HELLA GmbH & Co. KGaA, TE Connectivity, CTS Corporation, NXP Semiconductors N.V., Microchip Technology Inc., Infineon Technologies AG, and Panasonic Corporation.